Step right out of the Dubai Internet City in Barsha Heights and you’ll find the Metro Central Hotel where Sophie’s Cafe Dubai is located. It’s a pretty great place to grab a healthy breakfast in Dubai before you go on about your business for the rest of the day. This cafe is located on the ground floor of the hotel and is super Instagram friendly. The cafe has a selection of healthy (and not so healthy) treats and it makes me happy to see it’s one of the few cafes in Dubai that do not charge you extra for dairy free milk (So sip on that soy latte without spending any extra dirhams!). Expect plenty of avocado on toast, chia seed puddings, acai bowls and a vast selection of gluten free, dairy free and vegan treats. I’m glad that cafes and restaurants in Dubai are finally picking up! F.C. 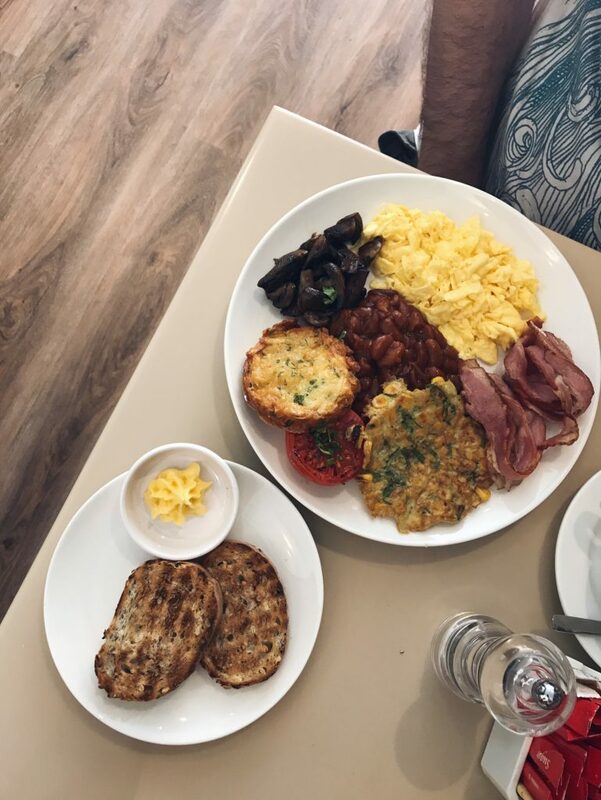 & I shared Sofie’s Cafe Dubai’s generous ‘Big Breakfast’ which arrived complete with eggs (cooked any way you like), veal bacon, corn fritters, hash browns, a grilled tomato, toast and saucy beans. Everything was delicious, from the fluffy scrambled eggs to the crunchy hash browns. The corn fritters was the only thing on the menu that I found a bit strange. It tasted a bit like a corn omelette. 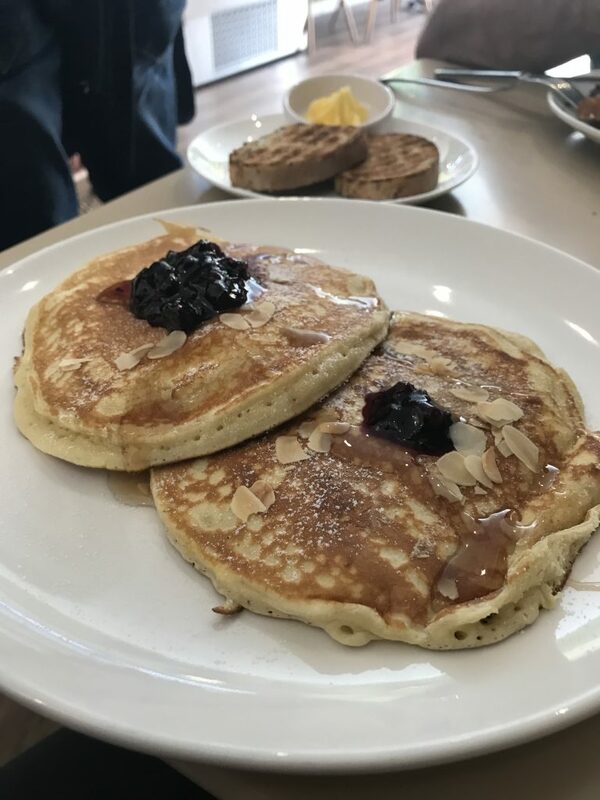 Delicious and alluring, these fluffy pancakes were true to their name and delicious with berry compote & almonds. Drizzle a bit of maple syrup, and you’ll love it! Sophie’s Cafe Dubai also has a power oats banana pancake that is gluten free as an alternative to your regular pancakes. Inn the Park – For delicious Turkish eggs! What’s your favourite healthy cafe in Dubai? Have you been to Sophie’s Cafe Dubai yet? Disclosure: I was offered a free meal in exchange of this review. However, thoughts and opinions remain my own.